You must be a member of the Barcelona Changemakers Group to attend this activity. Would you like to join this group? Hi all, would you like to join me in this workshop on how to connect with the audience as a public speaker? A 2.5-hour interactive workshop for those ready to take their public speaking to the next level with a TEDx speaker and book author Anastasia Dedyukhina. This workshop is highly interactive combines practical exercises and theory and personal experience from the speaker. 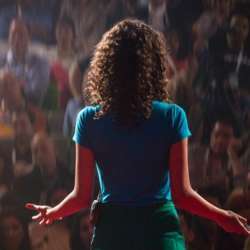 You will gain lots of valuable insights into how to connect with an audience as a TEDx speaker and how to prepare for a TED talk, but it will also be useful for you if you don't want to be a TED speaker and simply want to improve your speaking capabilities. See you 15 min before at the entrance!